Seven in ten people engage in smartphone activities while driving. 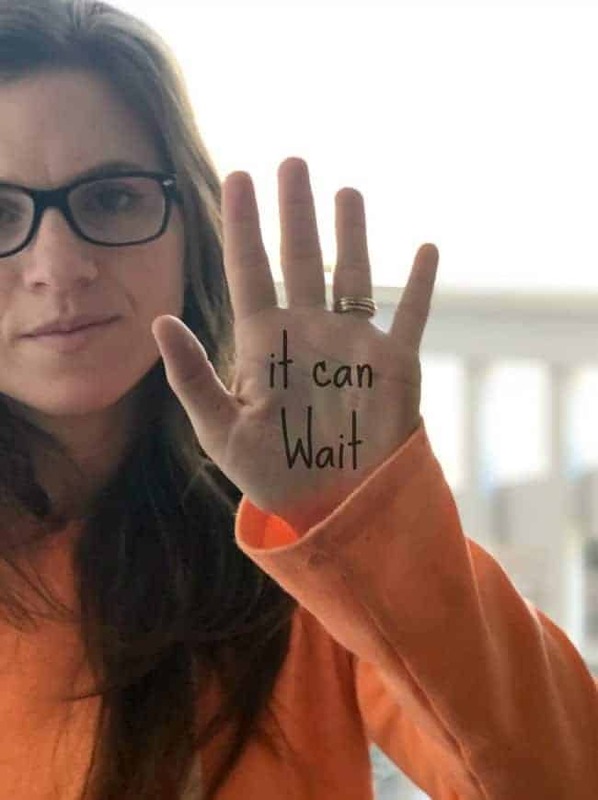 I recently participated in the #ItCanWait 21-Day Challenge. It’s is about cutting out smartphone distractions while driving. I was guilty of making phone calls while I was in the car and checking directions on my phone GPS. I was one of the 62% who keeps their smartphones within easy reach while driving. The thing is… I now have four children watching me. The tipping point for me was thinking about how soon our oldest son would be driving. Every text that I read, every time that I looked at my phone, every call that I took… all taught him one thing: It’s ok to do these things while driving. It’s not. It is so dangerous. I want him to know this and I want all of our kids to know it. 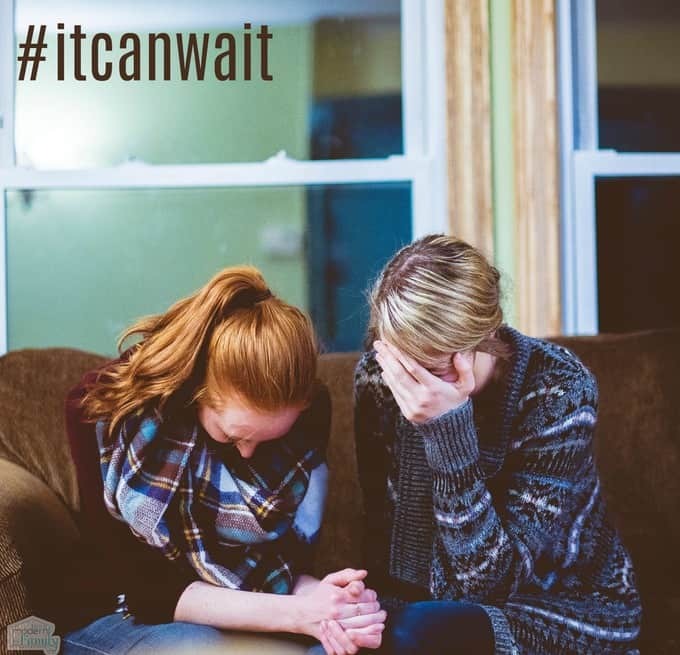 This challenge helped me to realize that It Can Wait… all of it. Even when our kids aren’t with me, it can still wait. I have four children waiting at home for me, so I want to make sure that I make it home. I want to make sure that other families make it home too because you are never alone on the road. Did you know drivers are more likely to drive responsibly when they have passengers in the car versus when they are alone in the car? Did you know that research shows that people ARE putting their phones down during important moments like business meetings, dates and family time? Let’s carry that to the cars. Driving is important and although you might not have anyone IN the car with you, there are always others on the road. It is hard to stop using your phone when you are driving. I had a hard time not reaching for the phone to call someone at the light, or not checking to be sure that I didn’t have any messages while I sat in traffic. These times matter. Every second on the road matters… but it can wait! You are putting others’ lives in danger: other families, other children, other parents. Think about that for a second…. Think about the other driver’s family finding out that they were killed because of a meaningless text. It scares me to know that while 36% of drivers look at their smartphones with passengers in the car (even less when they are driving a child), an even higher percentage, 64% in fact, look at it when they don’t have a passenger with them. Try to imagine yourself as the person driving with your child, but the person driving beside you is one of the solo drivers… one of the 64%. The results of that situation could be fatal to both cars. It gets worse… Nearly 4-in-10 smartphone users jump onto social media while driving, 30% surf the net and the scariest of all is that 10% have a video chat while driving. It doesn’t take much. Just turn it off. Just wait. Listen to this story, watch the whole thing, and then decide if it is worth it. The kicker? More than 90% of those surveyed consider smartphone distracted driving to be dangerous. Yes, it is a habit. In fact, 1-in-3 drivers consider distracted driving to be a habit. Only 58% of people feel that using their smartphone behind the wheel is “very dangerous” compared to 78% of non-habitual distracted drivers. Ironically, they’re also twice as likely to have been involved in a near-crash or a collision. A friend of mine was in a car accident, not long ago, and they found that it was caused by a driver in the opposite lane who was texting and driving. Everytime that I reached for my phone, I pictured his face and remembered that it can wait. Everything can wait. Take the 21-Day Challenge. Experts say it takes at least 21 days to make or break a habit. 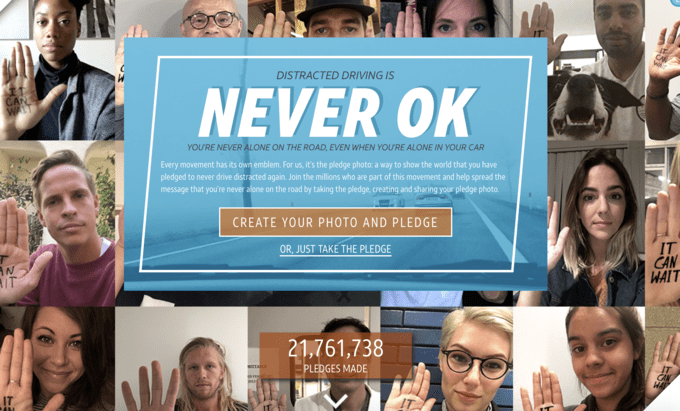 There have already been more than 20 million pledges – and counting – have been made by people to not drive distracted. Place the phone in the trunk of the car. New phones have a setting that stops texts from coming through while you are driving. Enable that. AT&T DriveMode is a great app to help curb distracted driving habits. The app is free and available for both Apple and Android devices and is available in English and Spanish. AT&T DriveMode can help to silence incoming alerts and phone calls to help you stay focused while driving. If your child has the app and turns it off, AT&T DriveMode sends a message to a parent to let them know that it has been turned off. No wonder there’s already more than 16 million downloads! Talk about distracted driving with friends and family to help stop THEIR habit. Research shows that 57% of people are more likely to stop driving distracted if a friend or passenger pressures them to stop.